Arihant Capital is one of leading full service broking house headquartered in Mumbai. 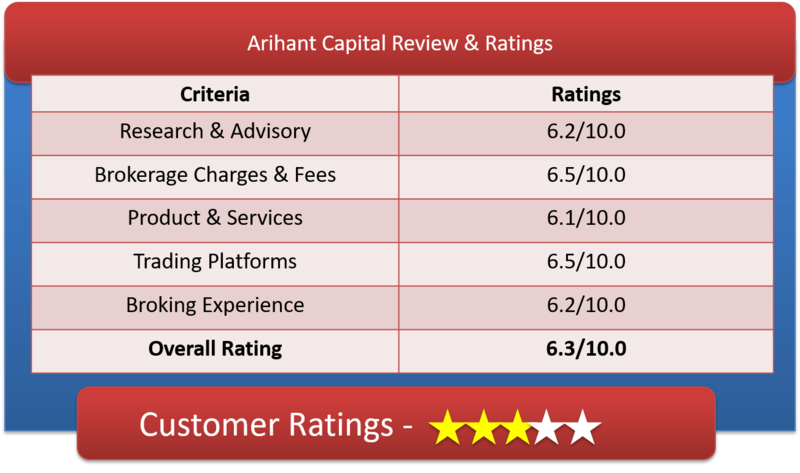 In this article we will look into detailed Arihant Capital Review, Arihant Capital Brokerage Charges, Arihant Capital Trading Platforms & other features. Arihant Capital deals into equity and derivatives market through BSE and NSE. It trades into currency market through MCX-SX. They also provides commodity trading on MCX and NCDEX. Arihant has its own DP service and is registered as a DP with NSDL and CDSL. The full product and services of this broking company include security and commodity trading, financial & investment planning, wealth management, mutual funds, IPO’s, research service and NRI/FPI services and a lot more. This full service broker serves individuals, corporate and financial institutions as well. Arihant Capital has about 700 + branches and franchise network spread across India. On customer service, this broker is very dedicated for customer service. They giving more values to hold a strong relationship which means the older you grow with them the better gets the offerings. Arihant believe in customized care, want to treat each customer differently and wants to help by dedicated relationship manager for each client. They provides access to all your reports online to make it transparent They have subscription of research report as well as SMS service to get quick updates. This broker also offers portfolio manager subscription that helps you to track your investment on real time. Arihant Capital Brokerage plan is quite simple and matches the rest in industry. The broker charges are: 0.20% for trading in equity delivery & 0.03% for trading in Intraday and Future. Option trading can be done at Rs 10 per lot (one side). The equity delivery brokerage of 0.20% is significantly less compared to all the big brokers in the industry. For Intraday and future traders, the brokerage rate of 0.03% is quite same as industry average in discount broker space. To avail all this brokerage rates, you must have Demat & Trading account with Arihant Capital. Currency Option Rs 10/lot and and Future trading for 0.005% of turnover. How to Open Arihant Capital Demat Account? Why Open Arihant Capital Demat Account? Complete investment avenues available – Equities, F&O, Currencies, Commodity, IPO, Bonds, MF, ETFs. Supports Algo /Automatic Trading which is flavor of the season these days. Multiple Desktop Base trading platforms. Advisory services based on technical, fundamental and market research. Won accolades like the Best Emerging Commodities Broker of India in 2011 and ranked in Forbes Asia ‘200 Best under a $ Billion’ List. Arihant Capital will provide you with multiple trading terminals for best possible service to their customers. On desktop base trading platform Ari-Trade Speed (ODIN Diet), Ari-Trade Pro (NEST), Arihant NOW and Ari Trade Manager are popular. Single login needed for Trading, Back-office & DP. Various order types- Cover Order & After-market Orders and many more. Trade on the go using this Ari trade mobile application. Get lightning fast trading experience, monitor your positions right online, view latest quotes, track portfolio and market movements, analyses market trends and much more anytime anywhere. With this application you can get valuable market insights. Secured and real time quotes and ability to execute orders from the palm of your hand. Track your portfolio, get stock quotes, create multiple personalized market watch and much more to experience. Ari-Mobile is optimized for all operating system Android, Blackberry and iOS. The broking house is spread far and wide in India through its branches across India. The Broker is also innovative in terms of tools and platforms. Arihant securities is offering multiple platforms for convenient trading and tools.